So you want to see a Murphy's Petrel? 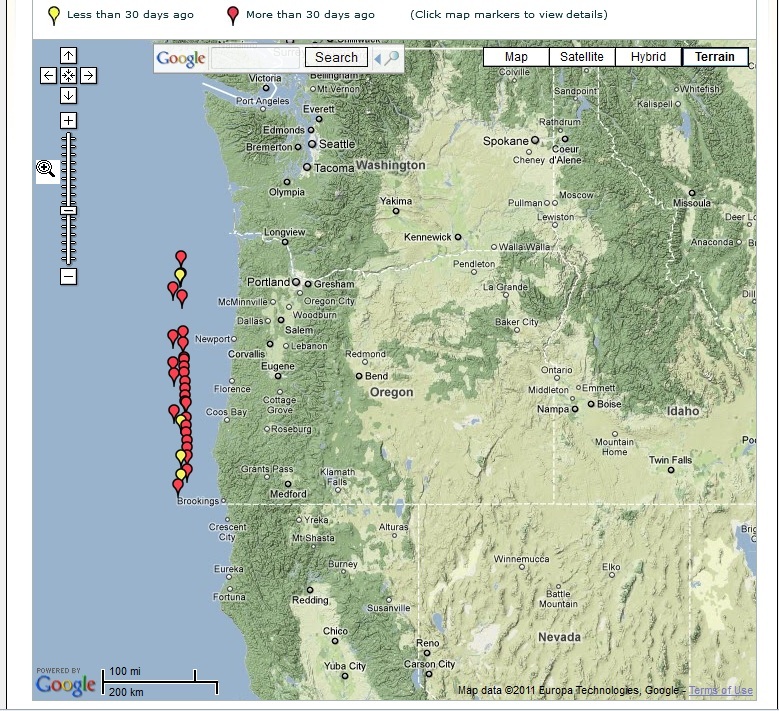 The eBird map above shows the Oregon locations of observed Murphy's Petrels on 4 cruise ship trips in May 2009-2011. You can click the map above for a larger view. 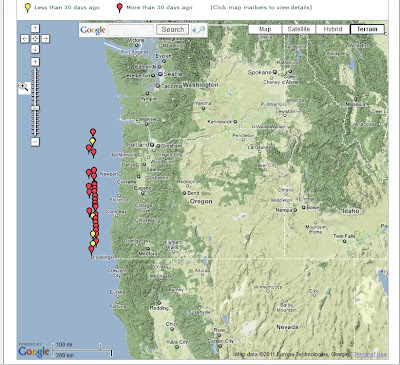 The yellow markers are sighting locations for the most recent trip (May 20, 2011) on which I went with 7 other Oregon birders. It turns out that cruise ships make repositioning cruises at the exact season (late April to mid-May) and exact distance offshore (45-65 miles) from Oregon to regularly find these rare solitary seabirds. Cruises departing San Francisco just after noon will have dawn just off the California/Oregon border, then spend all day off the Oregon coast. Ships arrive in Vancouver, British Columbia the next morning, a trip of just under 48 hours. Other cruises also depart for Vancouver from Long Beach, and spend an extra day at sea (but may not be off Oregon for all or any of the daylight hours). Murphy's Petrels are not attracted to boats as are some seabirds. So a spotting scope is necessary to see these amazing aerialists in their rapid, bounding flight. ID is difficult, so you may wish for experienced seabirders to travel with. And this far to sea total bird numbers are often quite low--Leach's Storm-Petrel is the most common bird. Murphy's Petrel numbers vary from year-to-year. And each trip is different, depending upon location at sunrise, observer effort, and weather conditions. Of the 5 cruises in spring 2011 with birders aboard, only two of the trips saw Murphy's Petrel off Oregon (though all trips saw Murphy's Petrels in either Oregon or California waters, or both). There are dedicated deepwater pelagic birding trips out of Santa Barbara and San Diego (mulit-day trip) that find these birds occasionally. But, by far, the easiest way to see these birds is to board a luxury ocean liner for these spring repositioning cruises. Interesting.... birding is unpredictable, but seabirding is even more unpredictable ! Thankyou Greg for sharing so useful information for seabirders.